Hello everyone and welcome to another edition of Me Talking. Today, I want to talk about a touchy topic. The topic is the events currently taking place in Ferguson, Missouri. Some witnesses said Michael Brown had been shot in the back. Another said he was face-down on the ground when Officer Darren Wilson "finished him off." Still others acknowledged changing their stories to fit published details about the autopsy or admitted that they did not see the shooting at all. An Associated Press review of thousands of pages of grand jury documents reveals numerous examples of statements made during the shooting investigation that were inconsistent, fabricated or provably wrong. For one, the autopsies ultimately showed Brown was not struck by any bullets in his back. Prosecutors exposed these inconsistencies before the jurors, which likely influenced their decision not to indict Wilson in Brown's death. Bob McCulloch, the St. Louis County prosecutor, said the grand jury had to weigh testimony that conflicted with physical evidence and conflicting statements by witnesses as it decided whether Wilson should face charges. Now, after researching the evidence and looking at the case through most angles, one fact is true. Mr. Brown was shot repeatedly including two shots to the head. He was shot in the arm several times. The two shots to the head were not necessary. 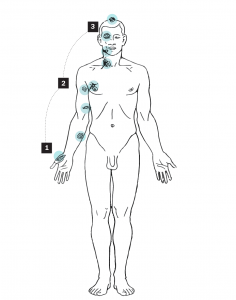 Below is the official autopsy graphic showing the shots Michael Brown took to his body. I know, it’s crazy to even think that so many shots could be fired at an unarmed man. I am against police brutality. Personally, I don’t consider this a racial issue, and I hate it when people want to bring race into this picture. Why mention he was a BLACK man killed by a WHITE officer? We should be looking more into the idea of power abuse by the police (which happens much more often than you think) that seems to be the basis to which all of the recent cases have looked like. Another issue is the looting. I don’t care if Michael Brown was ran over by the officer, there is no excuse for the people of Ferguson to loot THEIR OWN COMMUNITY BUSINESSES. The rioters were not even going after government buildings even though they were angry with them. It was a tragedy, but the ignorance and stupidity the rioters showed that night and the nights following were extremely daft. The parent (the actual father) of Michael Brown called for no violence, and the people did what they did. That’s why the UN people moved out. That’s why Anonymous will not support them anymore, and that’s why ultimately, Ferguson stands alone. That’s all I have to say.